Small businesses should always be looking for ways to improve the administration of the company. Whilst many software packages have features that allows a small business to invoice, keep records and list clients, few are integrated and therefore, take time to manage. This article demonstrates how CRM systems can help small businesses make larger profits and deliver continuous customer satisfaction. A Customer Relationship Management (CRM) system is a piece of software that manages a business’s dealings with their customers. A CRM will usually organise and automate sales, customer service and marketing. 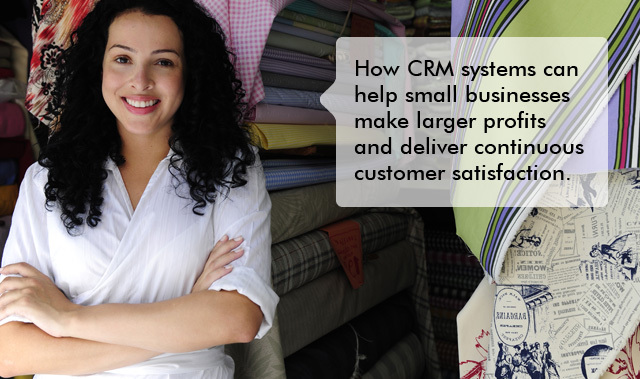 But just what can CRMs do for small businesses? CRM software can help a small business understand their customer base better, leading them to develop targeted marketing campaigns rather than ‘one-size-fits-all’ type campaigns. To give an example, a CRM can show you if the majority of your customers are in the legal sector, which means it might be an advantage to hire staff that have legal backgrounds or training who are better able to respond to and understand your customers’ needs. This leads on to the development of customised sales strategies. For example, a CRM can help show you the demographics of your customer base, determine which products are selling best, and which price points are most acceptable or which are putting your customers off. In this way, you can target those customers who are likely to provide the best returns. A CRM can make it much easier to keep track of profits because it will have an in-built accounting programme that keeps the company’s books, provides accurate financial reports and cuts down on the need to keep an eye on every incoming and outgoing. It does not mean that your company no longer needs an accountant, but it does mean that your business’s finances are up-to-date and accounting processes are streamlined. Understanding your customers better leads to better customer service. For example, with CRM, a business can see at a glance the number and type of complaints made and react swiftly to them. Perhaps more importantly, CRM can show your customers’ buying trends and anticipate purchase needs. This means that you can stock up on products that are most likely to be required by your customers and dispatc them that much quicker, resulting in improved customer satisfaction with the service you are providing. For small businesses, CRMs present an opportunity to streamline processes and improve the way the company carries out its day-to-day running, delivering customer satisfaction and increasing sales. With CRMs typically improving the profitability of a business by as much as 25%, can your small businesses afford not to install a CRM?